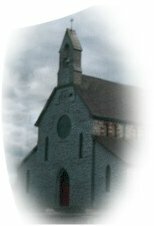 "How lovely is Your dwelling-place, Lord God of hosts"
"This is the House of God where God lives among His People"
Glenamaddy is rightly proud of St. Patrick's church, the House where God lives among the people of our community. This magnificent stone Gothic church stands out as a magnificent landmark on the Glenamaddy skyline. Rightly it is regarded as one of the finest churches in our Diocese, an impressive monument to the faith of the people of the parish. The whole Christian life of our parish revolves around our church, from Baptisms, First Confessions and Communions, Confirmations, Marriages, daily and Sunday worship, and finally, funerals. It is God's House where God lives among His people. We gather there at all the important moments of our lives; we worship our Creator and Saviour there. Each weekend God sends us forth to bring His life and love into our homes, our schools, our places of work and recreation, our community.